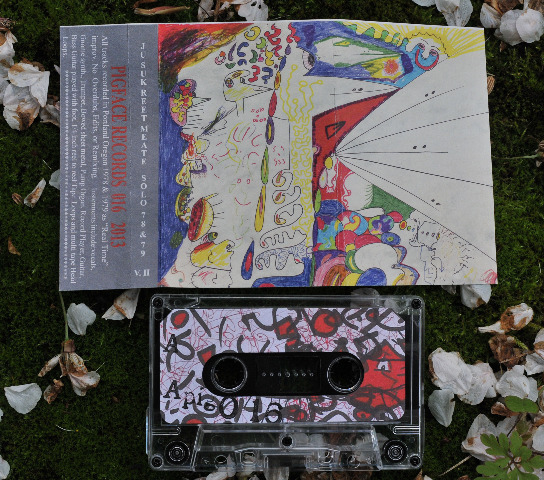 "Sidestepping all normal expectations on this album, Ju Suk Reet Meate (founding member of Smegma) directly goes about casting musical spells, utilizing primitive "inner mind" techniques on hammered dulcimer, tape loops, thrift store records, a homemade synthesizer, electric guitar, saxophone, mouth sounds, and manipulated christian radio broadcasts. Recorded in Portland, Oregon, these previously unreleased recordings reflect a similar "inner-mind over limited technique matter" aesthetic as the acclaimed but seldom heard classic Solo 1978-1979, originally released on Pigface Records in 1980." - Alga Marghen. "Smegma were formed as a reaction to the bands perceptions of how horrible things were in the 70s. We moved up to Portland just as the Los Angeles Free Music Society came out of the closet. There was the whole punk scene and a rebirth of things, but when we left, it was the deadest, worst time to be there unless you were into glam. This disgust is reflected in the tone of the early classics Pigface Chant, Flash Cards, Disco Diarrhea and Glamour Girl 1941. The crown jewel, perhaps, of the early Smegma dawn, is this CD, a solo Ju Suk Reet Meate joint, recorded in 78/79 and pressed in a miniscule quantity in 80, this is a recording that has been largely unavailable outside of certain collector circles. Even there, you better rub yr rabbits foot/save yr pennies. But here comes the kingdom, finally made available in an affordably-priced digipak CD, with liner notes by Wolf Eyes John Olson and containing a couple of never before released tracks, Solo 78/79 aka Do Unseen Hands Keep You Dumb? is a post-Zappa, stoned blues/concrete melange of guitar, tapes, Do Unseen Hands Keep You Dumb? aka found sounds and voice. As a member of what many have called the greatest band of our time, Ju Suk Reet Meate has had an immeasurable influence, shaping the lives/sounds of the creators of underground culture the globe over, and this CD bears his heft."-Destijl. "Recorded in various locations in Portland Oregon 1978 and 1979 as " Real Time " Improv. with no Overdubs, Edits, or Remixing . Some final EQing and Editing in Smegmas Studio January 2013. Recording Quality varies Recorded at the same time as Pigface 004 (1980) This album embraces a rawer esthetic. Many tracks were recorded on portable Cassette decks with automatic level control . Ju suk plays Guitar, record Player, Bowed sheet metal, Trumpet, Vocals, Gnome Synth. , 1880s Pump Organ, Bass Guitar played with feet, and 1/4 inch Reel to Reel multi head tape loops all played in " Real Time " no Overdubs, Edits, or remixing." - Pigface.